I think I've died and gone to eyeshadow heaven. Ever since I started wearing M.A.C Mineralize Eye Shadow in Cinderfella, the compliments just haven't stopped coming. It's absolutely perfect for creating a smoky eye with a little bit of spice and bite. My trick is to take a shadow brush and sweep it four or five times across the shadow, then tap off the excess so it doesn't fall down onto my cheeks. With a very light hand, I then sweep it just across my lids -- making sure not to go up to the browbone so the dark shade doesn't overpower my face. 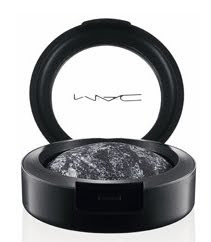 M.A.C Mineralize Eye Shadow in Cinderfella retails for $19.50.